Three weeks out from all my previous four marathons, I have taken to the trails around the Fewston and Swinsty reservoirs to grind out at least 22 miles for the final long training run. I blipped the central locking on the car and started my run, by force of habit I jammed in my earbuds. After a few steps, I stopped abruptly, realising that I didn’t need any outside stimulus on a day like this. I threw them back in the car. Birdsong and my own thoughts would carry me today. A gentle two or three opening miles brought my ageing tendons and joints slowly up to temperature. I dropped into a perfect easy rhythm, pinging along at around 7:30 per mile with my heart rate under 130, feeling that I was barely trying. If I hit an incline, I attacked it. Why doesn’t it always feel this easy? I’d intended to run 24 miles. The trails around the ressies aren’t flat and I normally start to flag at about 17 or 18 miles and the last lap is usually a slog. Not today. Halfway around my final lap, I calculated that if I doubled back and ran an extra loop of the top reservoir, I’d cover bang on 26.2 miles – so that’s exactly what I did. Instead of grinding out those last few miles praying for the end, I sped up, running the last couple of miles in a smidge over 7 minutes each. I ran my training marathon (with 1200 feet of ascent) in 3 hours 23 minutes and my average heart rate was 128, though I had a couple of stops for a drink and to take the photos. Maybe I’ve reached that place that all runners yearn– I’m fit. I guess I’ll find out in three weeks. It feels good. I have followed a few running blogs over the years. Most carve a similar path – a couple of years of regular postings, then less frequent postings then they become moribund and quietly dry up completely. I assume the authors either get injured, give up running or just lose the motivation for writing. I’ve only written posts for this blog intermittently, usually in the run up to a target marathon or a Comrades attempt. I have an autumn marathon looming, but through indolence, I haven’t bothered writing about it. I guess some would view that as a blessing. I’ve a latent anxiety that writing a blog is the literary equivalent of the execrable pouting selfie. However, a recent Marathon Talk interview with Jason Cherriman, (international marathon runner and a fellow blogger at the excellent http://marathonmanonamission.blogspot.co.uk) has inspired me to do an update on my summer’s training and preparations for the Yorkshire Marathon on October 9th – which will be my first race as a MV50 runner. Each of my last three marathons were completed in 2:56 something (though the first two turned out not to be marathons as unbelievably the Manchester course was 380m short…). I don’t feel that I have gone out and really attacked a marathon. I want to find out what my limit is. I want to run sub 2:55, maybe faster. At York on October 9th, I want to ‘go for it’. I ran Comrades on May 29th – as ever it was a phenomenal experience both physically and mentally. I wasn’t very fit when I ran it (erm, I walked quite a bit of it…), so unsurprisingly I was completely knackered for a few weeks afterwards. My physio had warned that if I ran, I would suffer prolonged DOMS (delayed onset muscle soreness). Normally that lasts about 72 hours, I think mine lasted for about two weeks. My first race after Comrades was the hilly Otley 10 mile race, just 10 days later. Looking back, it was too soon to race. I suffered like a dog on the hills and limped home meekly in a time two minutes slower than last year. 5. I entered a few local races – the key ones being the Eccup 10 in July, the Newark half marathon in August and the Vale of York half in September. I had already entered another Ultra way back in the winter – the Race to the Stones in mid July – a 100km event along the Ridgeway path in the Chilterns. My friend Hannah from Valley Striders was running it. In my torpor after Comrades, I put RTTS to the back of my mind until it was only a couple of weeks away. I’d been lazy and not paid much attention to the logistics of how to get to a 100km point to point ultra race, run it and then get myself home safely. Obviously this would involve catching one of the organiser’s buses from the finish back to the start to pick up my car to get home. I guessed the race would take me around 12 hours, so I would be finishing on Saturday evening. I checked the website – all the buses leaving on Saturday evening were completely full and the earliest I could get back would be Sunday morning. I was snookered. In truth, this was a welcome excuse because I couldn’t face a 100km race so soon after Comrades. Physically and mentally I just wasn’t up for it. So I baled and decided to DNS. After a few weeks of steady running, I was feeling fitter and stronger and my mojo made an overdue return. Weekly Saturday morning parkruns were a yardstick to measure progress. I managed to duck under 18 minutes for the first time in ages on 16 July. The Eccup 10 in July also went well, it’s an undulating 10 miler which I ran really hard and covered in 63.06 for 19th place and second MV45. I took home a few quid for that, and for finishing third Valley Strider, as we nabbed the team prize. All of sudden, running felt really good and I thought that after another week or two of solid training I could possibly start attacking my PBs. However, just when you think you are flying, life can hit you in the face. I’d planned to have a go at my PB (17:41) at Woodhouse Moor parkrun the following Saturday. I had a steady week with two speed sessions and a day off running on the Friday, when I met with Hannah for lunch after her RTTS adventures. It was great to catch up though I remember eating some not so brilliant chicken curry. That evening, whilst watching TV at home I felt absolutely dreadful – queasy and nauseous and although I am a night owl I went to bed at 9.00 pm, hoping to sleep off the presumed food poisoning. I lay all night cowering in a foetal position, fearing that I’d vomit if I moved and just hoped to fall asleep and let my body fight whatever bug was ailing me. I didn’t sleep and by 6 a.m. I realised that I had to get up and get something to drink, I was terribly thirsty. I remember half staggering downstairs, feeling dizzy and standing by the kitchen sink. I had a glass in my hand. The next thing I remember is looking up at my kitchen ceiling. There was broken glass everywhere. I was sweating profusely and gasping for air and my head was banging. I tried to haul myself up by grabbing the kitchen worktop. I must have passed out again because I woke up face down in a completely different part of the kitchen. The wooden floor was smeared with sweat. My heart was racing. There was something seriously wrong. I have no idea how long I was out. I tried to get up – I couldn’t, I could barely move at all. I realised that there was something wrong with my neck, I couldn’t move it. I’d taken a blow to the back of the head when I fell and done something serious to my neck. Thankfully, I could just reach my mobile phone. I decided to phone my sister who lives a few miles away. It must have been strange for her getting a phone call at 6 a.m. from her barely coherent brother, but she said she would come straight round – she had a key, she’d be able to get in. I lay there, trying to work out what had happened. I had no idea. To make matters worse, I was completely starkers and I really didn’t want to be found like that, dead or alive. I grabbed my phone and crawled back to the stairs and hauled myself back to the bedroom, step by step. It was exhausting, but I somehow managed to collapse on the bed and wriggle into a pair of shorts whilst holding my head in a fixed position. My sister arrived and phoned NHS Direct. When the lady heard that I couldn’t move my neck, she immediately called the emergency ambulance and paramedic. They arrived 10 minutes later. The paramedic did some basic assessments – could I still move my legs? – Yes I said. Good, so you are probably not paralysed, he said. He took my blood pressure. I can’t remember what he said it was but I do recall him saying, my God, that is a low reading. My temperature was 39 point something. Because I couldn’t move my neck, the ambulance guys said that I would have to be immobilised, put in a neck brace and taken to hospital. I live in a mid-terraced cottage with a narrow staircase. The ambulanceman said that they wouldn’t be able to get me down the narrow awkward stairs if I was stretched out, so they wanted to get me on a sitting stretcher. Unfortunately, as soon as they raised my head to get me in a sitting position, I passed out again. My blood pressure and blood sugar was too low. I was put on a drip for about twenty minutes. I looked around, it was a surreal scene. I live a quiet life alone in a sleepy village and there were loads of strangers in my bedroom swarming over me. It didn’t feel right. Despite all that was going on around me, I remember thinking that I probably wouldn’t be able to make it to parkrun that day. Another ambulance team arrived – they were going to have to manhandle me over the newel post at the top of the stairs in order to get me out of the house and into the ambulance. Eventually, they got me out and safely into the ambulance. Things calmed down a little. The ambulance driver had to plan a route to the LGI that avoided speed bumps because of my neck injury. The Accident and Emergency department of the LGI at 7.00 a.m. on a Saturday morning is quite an experience. I had to wait a while to be seen and felt enormous sympathy for the NHS staff who had to deal with some thoroughly obnoxious and ungrateful people who were abusive and clearly off their heads on a variety of stimulants. It wasn’t all bad. I was tended to by a very beautiful Spanish nurse, unfortunately I couldn’t move my neck much to see her, but being a shallow male it lifted my spirits a little. I was taken for neck X-rays and various blood tests and later I saw a Doctor and a consultant. By mid-morning, they realised that I hadn’t broken my neck, so the brace was taken off and I could sit up, which was a great relief. They established that things weren’t as serious as had first seemed – I hadn’t had a Stroke, or contracted Meningitis. A caring young Irish Doctor said that it was worrying that this happened to me, my blood indicated that I had contracted a viral infection which coupled with low blood pressure caused me to pass out. I’d probably fallen backwards like a ‘rag doll’ and cracked the back of my head on the kitchen worktop causing a severe whiplash injury to my neck. I was even allowed to go home in the afternoon. I was really glad, I was dreading a stay in hospital. As I couldn’t move my neck much, I spent the next few days bolt still in my armchair, it was mind-numbing. Of course, there could be no running for a couple of weeks. My stiff neck took a fair few weeks to fully recover, but after a week I felt well enough to go back to work and think about running again. I still had about ten weeks until the marathon, so although this unforeseen health issue was a big blip in my preparation, I reckoned I still had enough time to be fully fit for York. The break seemed to do me some good, I took it easy for a week and then pretty much launched into a four week block of 60 – 75 mile weeks. The Newark half marathon was in mid-August. It was held on a flattish course and I was hoping to run around 82 minutes. It was a strange race in some ways. The starting pens were huge – just 5 minutes before the start I was in the sub 90 minute pen with only about 20 other runners, the pen could have easily held at least 500. The rest of the field was waiting miles back from the line. I didn’t have a great race, I went off too hard in the first few miles, running just over 6 minutes per mile pace. I then slowed dramatically after three miles, feeling awful and relinquished a few places. 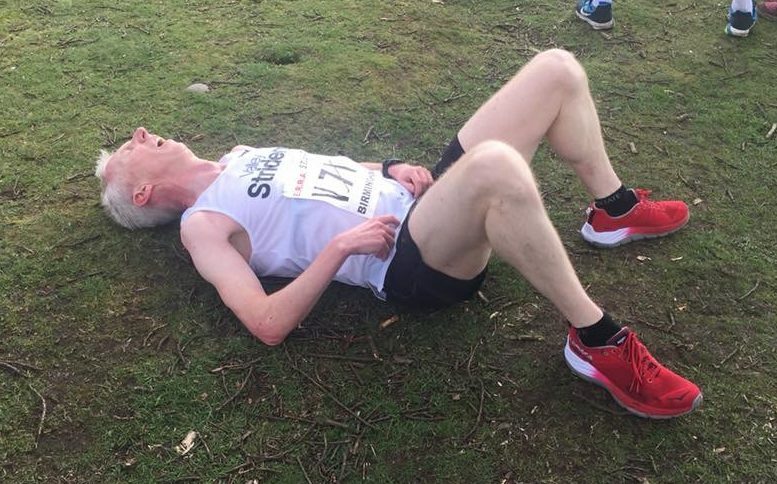 Bizarrely, in a race with 800 competitors, for about five miles I found myself running completely alone – unable to see anybody else either in front or behind. I managed to recover a little mid race and get some momentum going and I finished in 1:22.59 for 32nd place. I knew I hadn’t executed the race very well and I was a little disappointed with my effort, though the large amount of solo running hadn’t helped my time. The Vale of York half marathon was a month later. It was run on a pancake flat fast course. During the warm-up, my teammate Tim asked me what pace I was as planning to run. Tim is a similar standard to me and had been my partner on Leg 4 of the Leeds Country Way Relay the previous weekend. I held him back by running a shocker. I’d imbibed a few too many pints of ale at a wedding bash the night before and paid for it on the hills. I told Tim that I planned to go out steadily at 6:15 pace for the first few miles (sub 82 target) and see how it went. My first three miles were run in 6:11, 6:10, 6:13 and 6:17. It felt comfortable, my heart rate stabilised in the low 150s. Tim ran alongside me for the first few miles but then I slowly pulled away from him. As most runners set off too fast, I started to pass other runners. In the middle part of the race, I pressed on and I had that lovely feeling of moving through the field, bridging from group to group. My pace improved to steady 6:05s. I went through 10 miles in 61:20 and pushed on. I realised that I probably wouldn’t quite beat my PB (80:27), but decided to give it a go and buried myself over the last two miles, eventually finishing in a satisfying 80:52. This picture, taken at 13 miles, demonstrates that I was at least trying (photo credit Philip Bland). I felt I had really ‘nailed’ the pacing and my sequential 5K splits of 19:14, 19:14, 19:09 and 18:58 told me that I’d set off conservatively and gradually got faster, a great way to tackle a race if you can manage it. The Monday and Tuesday after the Vale of York race were spent with my two best mates from school, Andy and Rob. As we live in different parts of the country, we rarely get to meet these days. To celebrate impending 50th birthdays, we’d long planned a two day cycling trip around the Yorkshire Dales, roughly following the route of Stage 1 of the 2014 Tour de France, with an overnight stay in a pub in Hawes. In a moment of uncanny synchronicity, as we set off at 9.30 am on Monday morning, Andy mentioned that it was exactly 40 years to the day, indeed almost to the minute, since we’d all first met as nervous 9 year-olds on the first day at middle school in 1976. Quite a sobering moment. It was a brilliant trip, I loved every single minute. Riding your bike with great mates through one of the most beautiful places on the Planet, what could be better? Later that week, I had a curious incident with a dog lead whilst running in Roundhay Park. A young lady thought it OK to have a picnic, but tethered her dog to a post and let the long thin dark grey lead stretch straight across the dark grey path as a perfect tripwire. Luckily I was only jogging when I head butted the tarmac after tripping over the lead. I lay there dazed for a few seconds, not knowing if I was seriously hurt or not. As she panicked I couldn’t find a single word to say to her. How could she be so galactically stupid? Miraculously, I escaped with just a fat lip and cuts and bruises. So, just three weeks to go. I just need to avoid another accident or health scare and we should be good to go. There are no more long runs to do, but I do have a couple of races. I’m quietly chuffed to make the B team for my club at the Northern Road Relays in Manchester next weekend. I’m definitely the oldest, and probably the slowest runner, but we are a strong club. The event is 6 x 6.4k legs – I’m looking forward to it. I can get my cross country spikes out the Sunday before the marathon as it’s the first XC race of the season at Thornes Park in Wakefield. I’ve always been happy to race during a taper, I think it keeps one sharp.